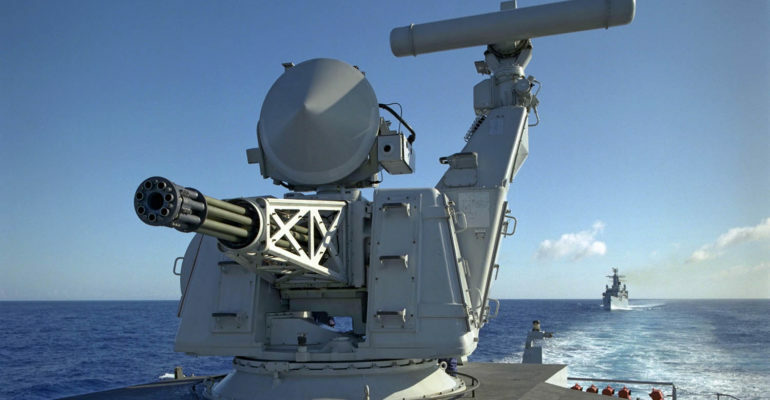 The Goalkeeper Close-In Weapons System (CIWS) is a ship-mounted short-range air defense system (SHORAD) that combines a 30 mm, 7-barrel Gatling gun (GAU-8 Avenger) with special missile-piercing ammunition in order to protect vessels from incoming missiles. [i] Being a CIWS (“sea-whiz”), the Goalkeeper is intended to be the last line of defense against projectiles that have successfully evaded other defenses. It is currently used by the naval forces of Belgium, Chile, the Netherlands, Portugal, Qatar, South Korea, the UAE and the UK. [ii] The system is completely autonomous, being able to engage in surveillance, detection, destruction, and then select the next priority target on its own. The Goalkeeper can fire up to 4,200 solid tungsten sabot rounds per minute from its GAU-8 Avenger cannon. Specifically, the Goalkeeper uses missile-piercing discarding sabots (MPDS) and frangible missile-piercing discarding sabots (FMPDS) made from Tungsten alloy. The Goalkeeper has also proven its effectiveness in practice; the United States tested the weapon by firing three separate missiles in the system’s range- all were intercepted. [iii] An I-band radar is utilized to ensure all-weather detection capability and pin-point target tracking is accomplished with a dual frequency I/K-band tracking radar. The Goalkeeper and CWIS systems are actively changing the nature of naval warfare by adding another layer of defense to vessels. Additionally, the GAU-8 Avenger cannon has a range of 0.76-1 mile, making it useful for aircraft or projectiles that are farther away. [iv] The Goalkeeper is also fully autonomous, making it useful against high-speed targets that would be difficult to detect and follow by a human-operated system. The Goalkeeper also has specific implications for certain countries. In South Korea, the Goalkeeper can be used to safeguard its vessels against an increasingly hostile North Korea. The Goalkeeper can also be used against surface targets, by deploying ships near land or coastlines.